Internet advertising is one of the sources of profit for the websites, which show different ads on their pages. But it is often the case that intrusive banners and animated advertisement only annoy the users and distract them from the content. The solution for your favourite browsers are Adguard ad blocking extensions, that will help you to cope with this problem. Our free adblock browser extension is available for Google Chrome, Opera, Yandex.Browser, Safari and will soon be released for Mozilla Firefox. Adguard browser extensions for blocking ads have one set of functions and work in all browsers just the same. First and foremost the extension works as an adblocker and blocks pop-ups, banners, removes video ads and other advertisements in browser. One of its advantages is the easy and intuituve interface. The functions in the menu will help you to adjust the Internet for yourself. The menu is opened by clicking on Adguard extension icon, which appears in the corner of browser toolbar after installation. When you open the website where the undesirable ads were, the number of blocked elements appears on the extension icon (as shown on the picture). However, you can disable this function in the general settings. For that end, you need to open the extension menu and click on “Adguard settings”. In the “General settings”, you can configure our adblocker the way you want with the help of switches. You decide by yourself whether Adguard shall show the acceptable contextual advertising that can be useful for you or block it. You can also choose the suitable filters, including the filter that removes widgets of social networks that can track your activities on the webpages. You can also make up your own white list of websites, which you trust – Adguard will not process them. The extension works not only as an adblocker, but also functions as an antiphishing tool. 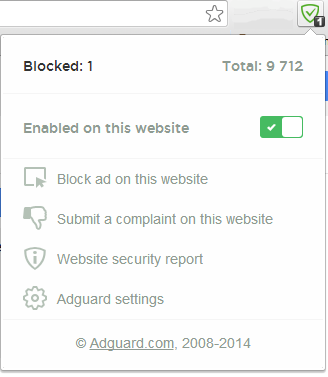 Adguard protects you from fraudulent and malicious websites, by blocking the access to them. If any website seems suspicious to you, you can read its security report. In the extension menu mentioned above you can find the corresponding link. 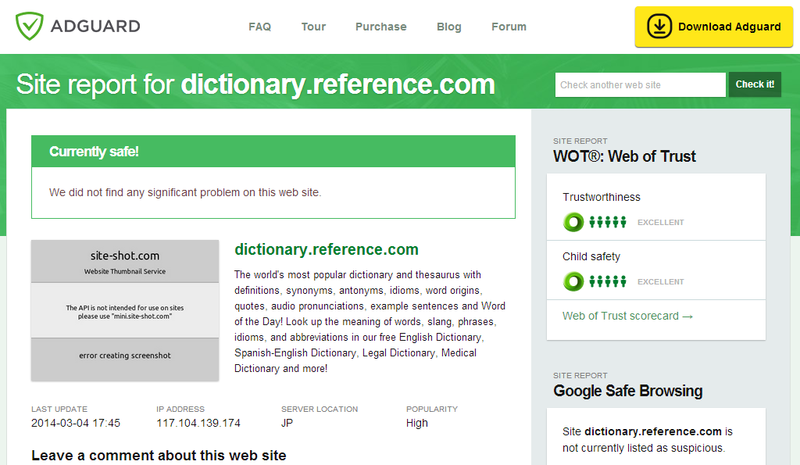 Clicking on it will open the page, which contains data on trustworthiness of the site, its popularity and child safety. When checking the URLs (addresses of websites) Adguard uses black lists of Google Safe Browsing* and Web of Trust** in addition to its own database. *Google Safe Browsing – Google service, that provides lists of addresses of the websites that contain malware or phishing pages. **Web of Trust – program that warns users about danger, if they go to the website with a low reputation. It operates on estimates of millions of real users. You can also submit a complaint concerning the website that you consider suspicious. Just click the corresponding link in the extension menu and write a comment (if you want), illustrating what is wrong with this website. Adguard uses its own filters, which are updated on daily basis. Every day the addresses of the checked websites are added to our database. Thereby the checking process speeds up and the extension works faster in comparison with many other adblockers. If for some reason our adblock for browsers does not suit you - you can continue to search among other ad blocking extensions, for example – Adblock Plus / ABP, Ad Muncher and others.